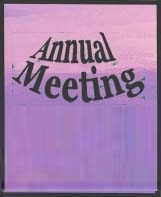 The EMHA's Annual 2018 Meeting is scheduled for Thursday October 11, 2018 from 7 PM to 9 PM at the Aspen Ridge Church located at (Click for a Google Map) -- 27154 N Turkey Creek Rd, Evergreen, CO 80439 located on Highway 73 and the North Turkey Creek round about. Important EMHA Annual Meeting documents that will be reviewed during the meeting are shown below. Access to the documents is accomplished by clicking on the document's link below or click on the file's attachment provided at the end of the web page. 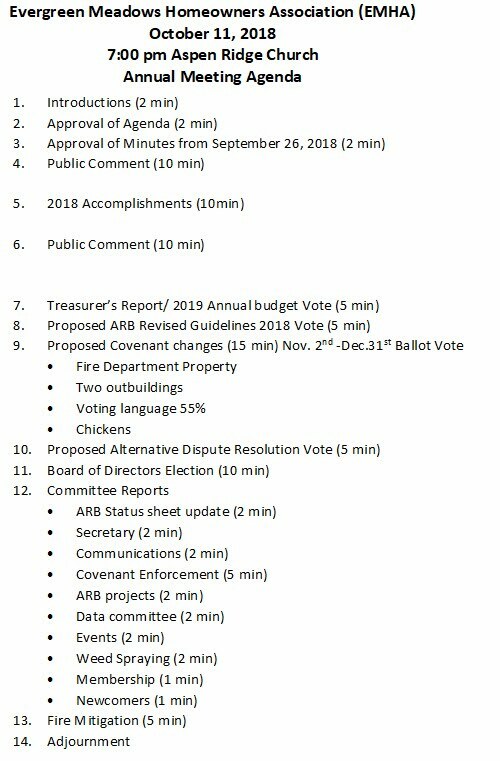 The EMHA Annual meeting agenda is shown above but also displayed below are the following items are among the most notable. ARB Guidelines - The final Evergreen Meadows Association (EMHA) 2018 Guidelines have been board approved and approved by legal counsel. Previous years' ARB Guidelines are included to assist in document comparison. Board elections - The 2019 EMHA Board elections will be held at the annual meeting. Interested parties can submit their names and area of interest via Email at - nominations@emha.us - by end-of-day on Saturday October 7, 2018 . The more people that are involved, the healthier our organization, and the better our decisions and results. More volunteers also equate to more homeowners' representation on issues before our community. It's a good way to learn about our community's dynamics while getting to know the Evergreen Meadows' neighbors. All that is required of a board or committee member is their EMHA dues are paid through 2018. Four potential covenant changes - In accordance with the EMHA's covenant's article 22 - Subject - Period, Amending and Renewal - covenant changes can be applied every 10 years with a homeowner majority vote, and that period of opportunity is upon the board now. Four potential covenant changes will be presented to the annual meeting attendees and any approved changes will be presented to Evergreen Meadows homeowners through via signature collections between November 1, 2018 and December 31, 2018. Below are the four proposed changes. The link to the EMHA on-line covenants is l- DECLARATION OF COVENANTS AND RESTRICTIONS FOR EVERGREEN MEADOWS . a. Changing the zoning of Evergreen Fire Department’s property, Unit 8 Lot 82, from fire department to residential so to facilitate the EFD’s sale of their property. b. Allowances for residents to have two accessory buildings on their properties, rather than the existing one allotment. c. Changing the wording of Covenant 21 to reduce the required number of households needed to pass a Covenant change from 66% to 55% of the EM home owners. d. To allow EM Homeowners to raise a “reasonable” number of chickens at their homes. This flock would include hens, but no roosters. All homeowners are invited and dues paying members can vote on issues - one vote per household. Dues payments can be paid on-line at http://www.emha.us/dues, and will also be accepted at the meeting. The EMHA board looks forward to seeing everyone at the meeting. Please contact us with any questions at board@emha.us .